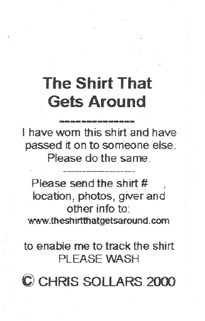 The objective is to wear the shirt and pass it on to another person, and to track where the shirt goes. Each particapant is encouraged to write the website with a story of who gave them the shirt , where, the shirt number, a description of who they are, and any other experiences with the shirt. Photos and other images of the shirt are encouraged to create an album of the journeys of the shirt on the website or on FACEBOOK. Such as giving the shirt to another or posing in it.